Star Cruises is a cruise line headquartered in Hong Kong and operating in the Asia-Pacific market. The company is listed on the Hong Kong Stock Exchange and the Singapore Exchange and is owned by Genting Hong Kong. It is the eighteenth largest cruise line in the world after Carnival Corporation, Royal Caribbean Cruises, and 15 others. The chairman of Star Cruises is Tan Sri Lim Kok Thay, the son of the late Tan Sri Lim Goh Tong, the founder of Malaysia's Genting Highlands. Star Cruises was founded as an associate of the Genting Group of Malaysia, incorporated in Bermuda on 10 November 1993 with its corporate headquarters in Hong Kong. The company's first ships were two cruise ferries acquired from the bankrupted estate of Swedish Rederi AB Slite. In the following years, the company purchased several other used ships. In 1998, Star Cruises took delivery of its first new build, SuperStar Leo, followed by sister ship SuperStar Virgo in 1999. Star Cruises also acquired Sun Cruises the same year. 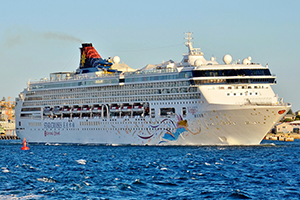 In 2000, Star Cruises fully acquired Norwegian Cruise Line, including its subsidiaries Orient Lines and Norwegian Capricorn Line, becoming the largest global cruise line in the world. Norwegian Capricorn Line operations were soon merged into those of Star Cruises. 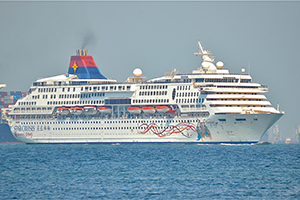 Before the purchase of NCL, Star Cruises had several other new builds either planned or already under construction, but with the merger of the two companies, most of the constructed builds joined the NCL fleet instead of Star Cruises'. In 2001, Star Cruises founded a new sister company, Cruise Ferries, which began operating its sole ship, Wasa Queen, on short cruises from Hong Kong to Xiamen followed by overnight gambling cruises from Hong Kong and gambling cruises from Port Klang in Kuala Lumpur. Wasa Queen ceased to function and was sold to another company in 2007. In 2004, SuperStar Leo, Star Cruises' then-largest ship, was transferred to NCL to take over Norwegian Sky cruises as she had to be rushed into service under NCL America brand due to the Pride of America not being ready on time due to sinking at Lloyd Werft shipyard. 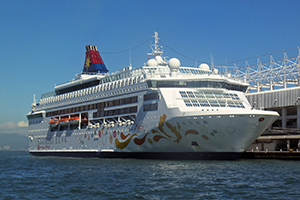 Since 2006, the trend has been that new ships were to be built for NCL, and the old ships in the NCL fleet would be transferred to the Star Cruises fleet in Asia. In early 2008, both NCL America and Orient Lines brands were discontinued, with the latter's sole ship, MS Marco Polo, sold to Greek interests. Also in that year, the first ship from NCL was transferred to the Star Cruises fleet as SuperStar Libra. Starting from 2011, Star Cruises received a new hull art. SuperStar Virgo, SuperStar Aquarius and Star Pisces have received their new hull art. It was announced on 27 April 2012 that the Norwegian Dream will join the Star fleet, she will be named as SuperStar Gemini and will start service in 2012. 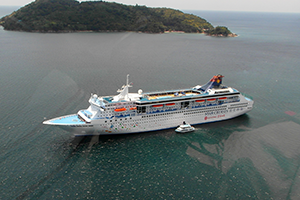 On 7 October 2013, Star Cruises announced that Star Cruises and their parent company, Genting Hong Kong, have entered into an agreement with Meyer Werft shipyard for the construction of one new cruise ship for Star. The vessel will have a capacity for 3,364 passengers at double occupancy. The ship will be delivered sometime in Fall 2016. 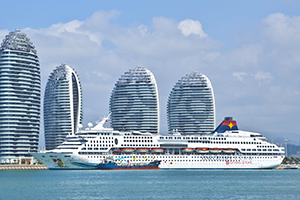 Star Cruises announced on 10 February 2014, that a second ship was ordered and will be delivered by Fall 2017. Both ships will 150,000 GT. On 9 February 2015, the first steel cutting ceremony for Genting World was held at Meyer Werft shipyard. The company announced in March 2018 that one of its ships, SuperStar Libra, would end her public cruise operations for the company on June 27, 2018. On March 8, 2018, Genting Hong Kong announced that the first Global-class newbuild that was previously allocated to Star Cruises would join the Dream Cruises fleet. Star Pisces. Year built: 1990. 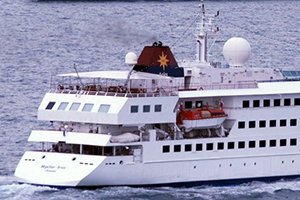 Entered service with Star Cruises: 1994–present. Gross tonnage: 40,012 tons. Previously Kalypso​. SuperStar Aquarius. Year built: 1993. Entered service with Star Cruises: 2007–present. Gross tonnage: 51,309 tons. Previously Norwegian Wind​. SuperStar Gemini. Year built: 1992. Entered service with Star Cruises: 2012–present. Gross tonnage: 50,764 tons. Previously Norwegian Dream. The Taipan. Year built: 1989. Entered service with Star Cruises: 1994–present. Gross tonnage: 3,370 tons. Previously in service as MegaStar Aries (1994–2013) and Genting World (2013–2015). Genting Hong Kong ordered two Global class ships for Star Cruises in 2016. In 2018, it was announced that the vessels would instead be delivered to Dream Cruises, with a new class of ships planned to be designed for Star Cruises.